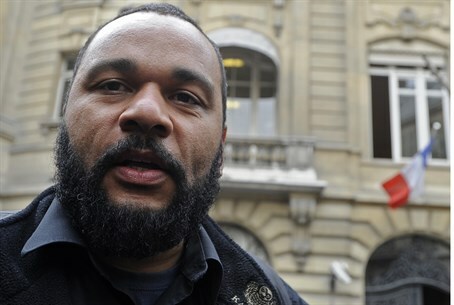 French police forces continue their crackdown on Dieudonne, and anti-Semitism, as they seize huge cash stash from his home. French police seized 650,000 euros and $15,000 in cash during a raid on the home of anti-Semitic comic Dieudonne M'bala M'bala as part of a probe into suspected fraud, sources said Wednesday to AFP. Police sources said the cash was found during a raid on Dieudonne's house in the town of Mesnil-le-Simon, south-west of Paris, on Tuesday. Dieudonne's lawyer Jacques Verdier confirmed that cash had been confiscated but claimed the 650,000 euro figure was "excessive." Verdier said the money was from ticket sales for Dieudonne's shows and there had been no attempt to hide it. The raids on Tuesday also targeted several other properties, including the Main D'Or theatre in Paris where the stand-up comic stages some of his shows. Authorities are currently trying to force Dieudonne to pay more than 65,000 euros ($90,000) in outstanding fines related to his convictions and suspect that the 47-year-old was planning to fraudulently declare himself bankrupt. Dieudonne, who has been widely accused of promoting anti-Semitism, already has a string of convictions for hate speech and other related offenses. Wednesday's revelation came as the French Union of Jewish Students (UEJF) began a legal action aimed at forcing Dieudonne to withdraw one of his videos from YouTube. The video (see below) that the UEJF is seeking to ban is entitled: "2014 will be the year of the Quenelle." The student organisation said it contained four excerpts which breached French law including one in which Dieudonne says: "It is not for me to choose between the Jews and the Nazis, I'm neutral in this business. "I was born in 1966, not 1900, so I don't know what happened, who provoked whom, who stole from whom .... I have my own little idea, but ..."
Video: "2014 will be the year of the Quenelle"
Dieudonne made headlines last month when the government, which has branded him a "pedlar of hate", succeeded in preventing him from starting a nationwide tour of a new show, "The Wall", because of its perceived anti-Semitic content. He has also generated controversy by popularizing the "quenelle", a trademark stiff-armed gesture that critics say is a disguised Nazi salute but that he defends as a generic "up yours" to the French establishment. The "inverse Nazi salute" hit headlines last month after being used by footballer Nicolas Anelka - who is a friend of Dieudonne - to celebrate a goal. Anelka now faces an official investigation by the British Football Association, and could face a ban of at least five games. Anti-hate groups have pointed out that Dieudonne's "quenelle" is anything but generic, having been embraced by anti-Semitic groups in France. Video footage and photos have revealed various anti-Semites performing quenelles outside synagogues, at a Holocaust museum and in front of the school in Toulouse where Islamist gunman Mohammed Merah murdered a rabbi and three Jewish children in 2012. Dieudonne's shows have been banned for their anti-Semitic content, in a move backed by government officials in the fallout of the Anelka incident, and has been forced to cancel a nationwide tour. French President Francois Hollande has condemned Dieudonne in the strongest terms, in a speech earlier this month. Police meanwhile announced they had charged a cartoonist Noel Gerard, also known as "Joe the Crow," for circulating on the Internet a photograph of a person performing the quenelle outside a Jewish school in Toulouse where a rabbi and three children were shot dead by Islamist gunman Mohamed Merah in 2012.
locations including Auschwitz, holocaust memorials and synagogues. In general, Anti-Semitism has been skyrocketing in France. One report revealed that anti-Semitic incidents rose 58% in 2012. Concerns have run so high that the Israeli government recently announced a program to help French Jews emigrate to Israel en masse - after reports have surfaced showing a growing exodus of Jews from France to other Western countries.